Thanks for the route idea, Claire, and thanks, Daggi, for the sunny pictures! NOTE: This route stays on the east edge of Hyde Park. 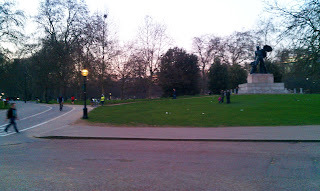 If you want to run the rest of the park, see the London Hyde Park Route article. I know of no city with so many beautiful and varied parks as London. So what could be better than to combine a few of the nicest ones into one great run? 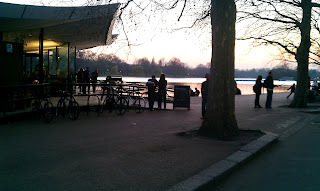 This one will take us through the three parks located on the west side of central London: Hyde Park, Green Park and St. James'. The three are strung out like pearls through some of the most interesting neighborhoods in town. 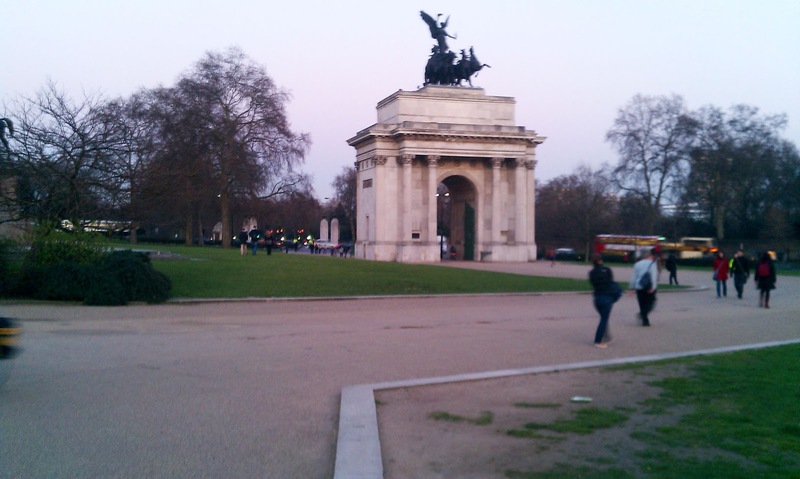 We'll start the run at Marble Arch, at the northeast corner of Hyde Park. This is where the busy shopping area of Oxford Street runs into Edgeware Road, and is serviced by various tube lines and buses. If you stand right at the arch, you will still need to cross the street at Cumberland Gate to get into the park. NOTE: If you're a fan of Banksy, the anarchic graffiti sprayer, he has an original work located at the video camera, down the stairs, at the foot of the arch! Start of run: follow those guys on the right! Once you set foot in the park, you'll see that a few paths fan-out from the entrance. Take the second one from the left, heading out through the lawn. 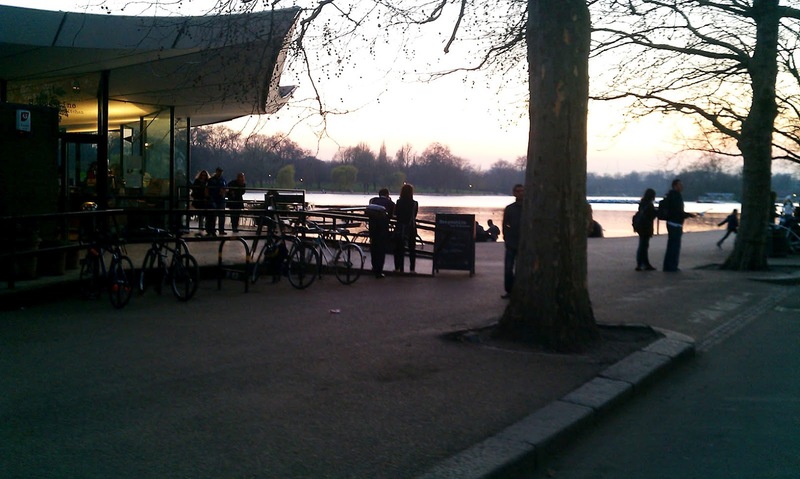 This will lead you 600 meters right to the café at the east end of the Serpentine lake, one of the busiest running tracks in the city. You'll probably want to just put your feet up and enjoy the scene right here, but no such luck: let's keep going! At the cafè, keep going straight down the little valley to the left, and take the first path as it curves to the left, going east. This path takes you through one of the nicest flower gardens in the park, and ends in the park's southeast corner. Here, go to your right, crossing Knightsbridge Street through the triple-archways of Hyde Park Corner to the traffic island. 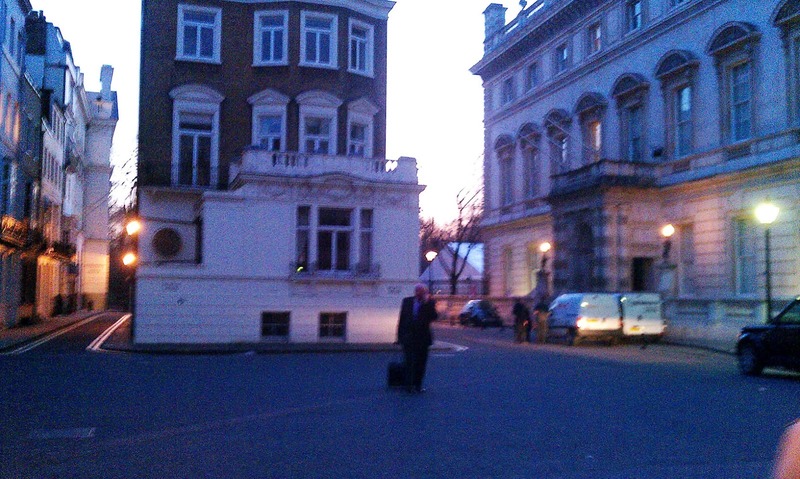 You'll have to cross the next street to get to the little square dominated by the next arch, Wellington Arch. Run through the archway, and cross still another street to get over to Green Park. In Green Park, remain on the right edge of the park, parallel to Constitution Hill. You might want to take the dirt path next to the paved sidewalk: there are fewer pedestrians there. The whole way now, after leaving Hyde Park, you are passing various veterans' memorials: for the British Artillery, the New Zealanders, the Asian- and African troops, and then the Canadians on the left side of the path. 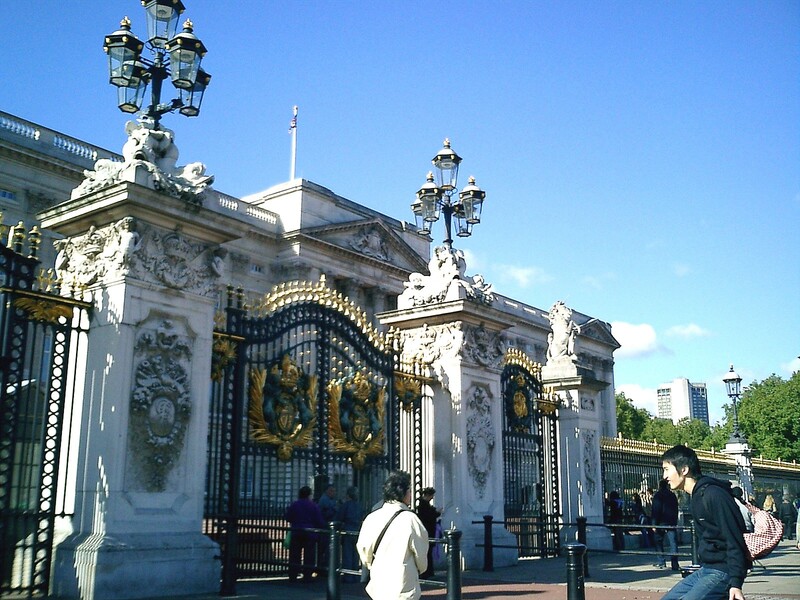 The path ends at the ornate gates across from Buckingham Palace, on the right. Let's cross the street and run along the front of the palace now, looking at the guards, and with the Queen Victoria monument on the left. After running to the far end of the palace, you'll need to cross the street and continue towards the left. 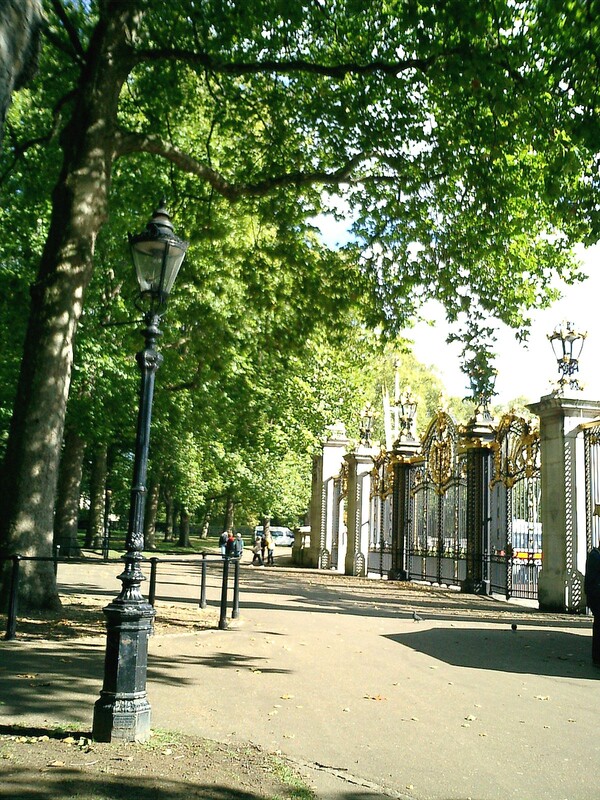 After crossing the 2 streets that go by the Victoria monument, you will enter St. James' Park along its southern edge, near Birdcage Walk. This is one of my favorite parks in the world. Within its small confines, there is a lot to see: the long pond, the beautiful flower gardens, cottages, cafés. We'll loop the park, with the water to our left side the whole time. This south side of the pond has fewer visitors and there is less to do. When you get to the little bridge that spans the pond on your left, maybe go out onto it and look towards Whitehall in the distance, to the east, the British Army headquarters. The collection of towered buildings looks a bit like a fairy palace on the horizon, especially when lit up at night. 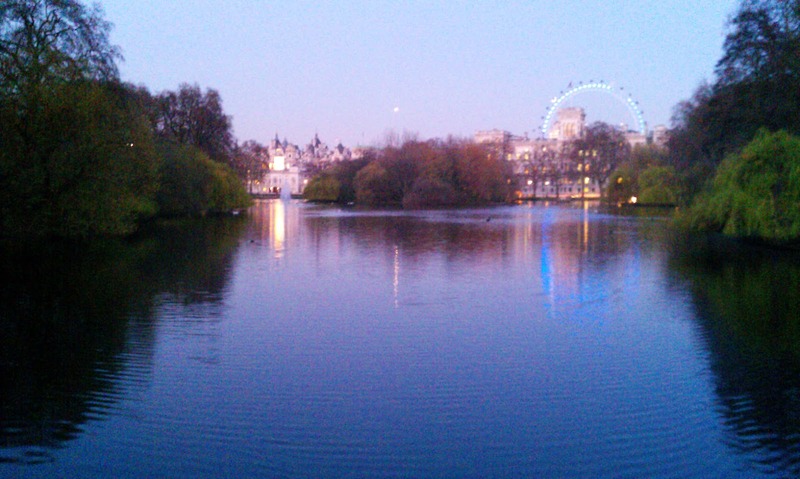 Keep running along the south side of the pond until you round it at the east end, across from Whitehall. The little cottage on the water's edge looks too picturesque to be sitting in the middle of a big city. This is the half-way point of the run. 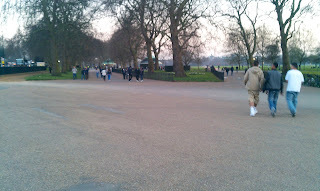 NOTE: If you want to take a little extra detour to see Parliament, the River Thames and Big Ben, just follow the street that borders the south side of the park, Birdcage Walk, straight east an extra 3 blocks. It only adds an extra half-kilometer to the run. Rounding the east end of the pond and heading west again, you'll find yourself on the most beautiful side of the park. The flowers are amazing here, and this is the place where most people come to sit, feed the ducks and hang out. When you get back to the bridge that spans the pond, turn right and head out of the park on the right side. 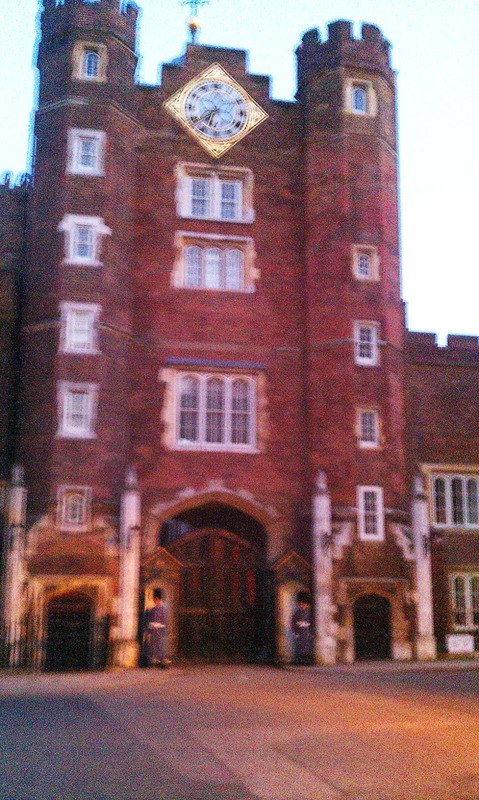 This will take us through the royal neighborhood of St. James before we get back into Green Park. 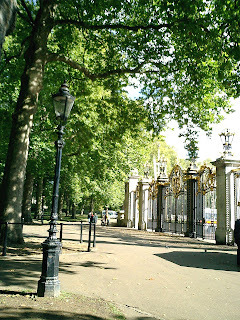 Cross the Mall (the boulevard connecting Buckingham Palace and Trafalgar Square) and run straight and you will pass St. James' Palace on your left. St. James' was built by Henry VIII, and is the oldest royal palace, but not terribly pretty. Nowadays the princes normally use it. Turn left at the end of the palace, on Pall Mall, and run past the palace sentries into the little square straight ahead. Stay to the right side of the square and run out along the right edge, to the right of Melwyn House. There is a pedestrian gate into Green Park there. Once in the park, turn left and run just 50 meters until you can catch the path turning right to head out through the middle of the park. 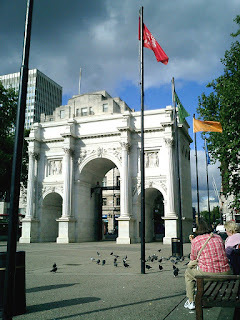 This will bring you back to the Hyde Park Corner end, across from Wellington's Arch again, where you have to cross the same 3 streets to get back into Hyde Park. Once inside Hyde Park, head north, where you'll see the giant statue of Achilles. Keep to the left of the statue on the broad pathway lined with sycamores. This path keeps fairly close to loud Park Lane on the right, and beautiful Mayfair beyond it. 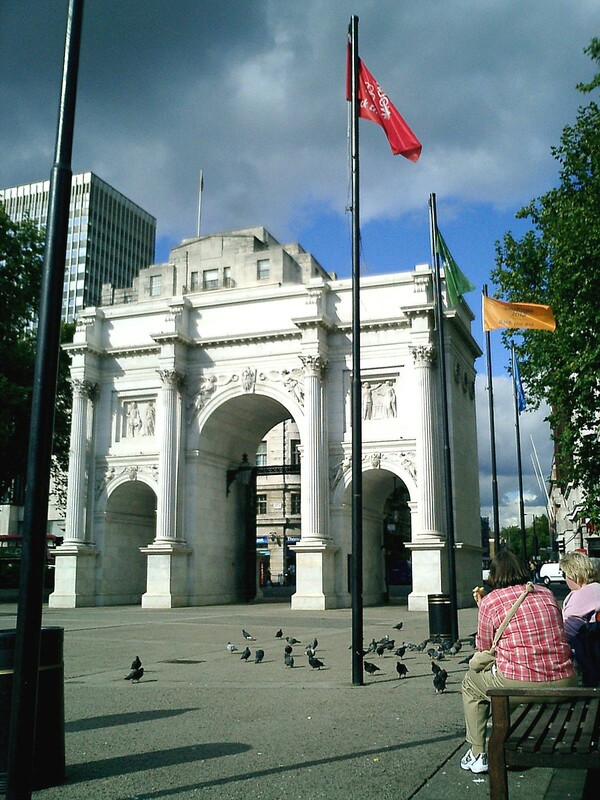 Keep running straight and in a few minutes you'll be back at Marble Arch, where you started.